JAKARTA - The Indonesian government fully supports the intention of PT Pertamina to manage the Mahakam block in East Kalimantan. Pertamina's current management are still negotiating a business to business with Total E & P Indonesie to get into managing the Mahakam block before the contract expires in 2017. “Pertamina if want to ask for cooperation with the another corporate still have to ask for a swap, in order to enrich Pertamina also,” she said. According Evita, the institute is very supportive of Pertamina can participate in the management of incoming block in East Kalimantan is. Previously, Evita once commented, the government will finalize a contract extension yet oil and gas cooperation Mahakam block the proposed Total E & P this year. Currently, the government is prioritizing the cooperation contract extension that will expire in the near future. While the Mahakam block new contract will expire in 2017. “There are still many things to be discussed related to the Mahakam block renewal of the contract,” said Evita. Minister Darwin Zahedy Saleh never asserted that the government wanted to enlarge the role of Pertamina in the Mahakam block. 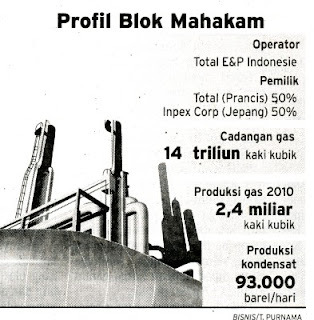 It is expected that before the contract expires, oil companies have the red plate to get into the Mahakam block. “If the contract is extended, the government wants the role of Pertamina enlarged. If this is not approved, the Pertamina ready to operate its own block,” said Darwin, some time ago. Pertamina spokesman Mochammad Harun told Investor Daily once said, the company is targeting a minimum of 45% stock control in the management of the Mahakam block before the block contract expires in 2017. “We’re hoping to get into the Mahakam block in the next year. Earlier the better. If you can early, so we can prepare the transition process on a regular basis,” he said. In fact, President Director Pertamina Karen Agustiawan adamant will go over some of concession management of the Mahakam block at the end of this year. “Although currently still under negotiation, but we want to get into the Mahakam before the end of 2010. at least we can grab a share (stock) of approximately 15%,” she said. 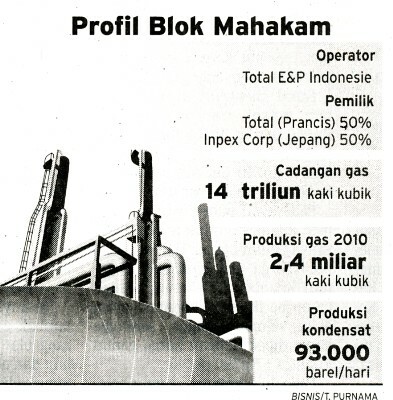 Meanwhile, the central government also gives ‘green light’ to the East Kalimantan provincial government to participate in managing the Mahakam block, after the contract management of Total E & P Indonesie and Inpex Corp on the block that ended in 2017. “It is fine if they (East Kalimantan provincial government) interested. They can enter the Mahakam block through share scheme participation (participating interest/PI) by 10%,” said Evita Herawati Legowo. Evita said, but the East Kalimantan provincial government can not just have the stock. East Kalimantan provincial government must have sufficient funds to acquire these shares. “It’s not a bulging stocks,” she said. Elan Biantoro, head of Public Relations and Institutional Relations Executive Agency for Upstream Oil and Gas (BP Migas), had once commented, it has received an official letter from the East Kalimantan provincial government about that desire. “They (the East Kalimantan provincial government) wants to join in the Mahakam block renewal of the contract later,” he said. However, Elan reluctant to disclose the amount of the desired percentage in the East Kalimantan provincial government in the management of the Mahakam block. “But, BP Migas promised to be ready to facilitate East Kalimantan provincial government wishes, provided that three conditions to participate in the management of oil and gas fields can be filled with East Kalimantan provincial government,” he said.